The results of the Kenyan national election are in, and although there is lingering controversy with a few elected positions, one incredible truth holds: women candidates made history. For the first time ever in Kenya, three women were elected into the Senate, and three women clinched the position of governor. Twenty-three women won seats in Parliament, an increase of six from the 16 women elected in the 2013 elections. In the build-up to this unprecedented win for women, WGLG-Kenya’s Women in the Red campaign launched an online media campaign promoting a positive image of women leaders – and spotlighting the social, cultural and structural barriers that hinder their progress as elected politicians. The centerpiece of the campaign, Ms. Politician, is an 11-part political drama series, created in partnership with YouTube influencer Wilson Muirania Gathoni, otherwise known as Jaymo Ule Msee. The series tells the story of a courageous and inspiring woman, Sifa Dede (played by actress Judy Maina), as she vies to become the first elected woman Governor of Kenya’s Tumaii County. The series script draws on real-life scenarios: on the challenges faced by women politicians, as well as their numerous (and often overlooked) accomplishments. Ms. Politician resonates with constituents because the series tells the very real story that women in Kenya have faced over previous elections: despite a Constitutional provision supporting gender parity in government, they have not been fairly represented. From 1963 to 2017, 50 women have been nominated or elected to parliament out of 1,807 people. In the last election in 2013, no women were elected into governor offices. Out of 9,263 people vying for Member of the County Assembly position (MCA’s), 1,365 men were elected, compared to 85 women. While it’s difficult to prove that Ms. Politician and the Women in the Red campaign influenced voters to support women, they certainly encouraged it. Two of the women who were recognized at the campaign’s 2015 Women in the Red Leadership Awards ceremony were elected into political office – Honorable Gertrude Mbeyu as the Woman Representative of Kilifi and Honorable Naisula Lesuuda as a Member of Parliament in Samburu West. And more than one million people tuned in to watch Sifa Dede win over constituents with her integrity and leadership skills on the weekly Ms. Politician series – many of them men. And from the moment it launched in June, the show generated consistent public dialogue on the issue of women’s leadership – through media coverage on popular TV morning shows and in daily newspapers; through social media support from the Communications Director in the Office of the President and other influencers; and through a Facebook Live event, which drew more than 14,000 participants. 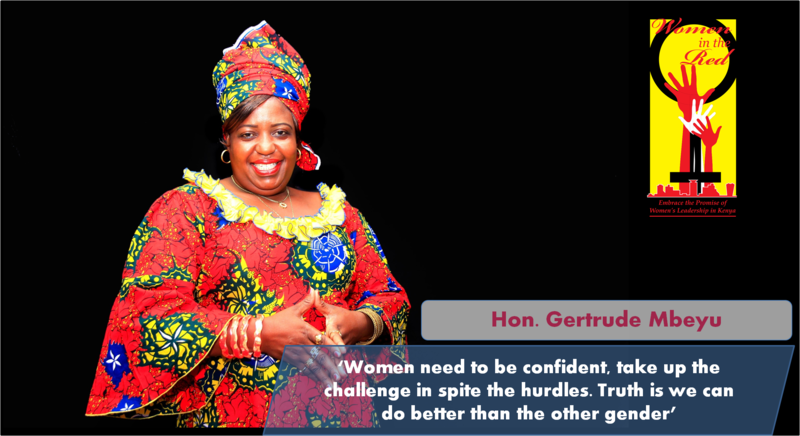 Honorable Gertrude Mbeyu at the 2015 Women in the Red Leadership Awards ceremony. Asked in an online survey whether Ms. Politician made them more likely to vote for a woman running for office in the 2017 elections, more than 86 percent of respondents said yes. Ninety-five percent of respondents reported that they learned something new after watching Ms. Politician. Sixty-five percent learned about the importance of community support for women leaders; 52 percent learned about the negative stereotypes that plague women leaders; and 50 percent learned about the contributions made by female Parliamentarians. Survey respondents also had the option to write in their own description of what they learned from the series. One man commented that he learned, “[the] importance of engaging men [as] allies in supporting women leaders”. Another man wrote, “women leaders can make EVEN better leaders to their male counterparts”. Women who were surveyed suggested that they’d gained courage and confidence in women’s leadership abilities – including their own. One woman wrote that she learned that women, “can lead too!”, and another wrote that she learned to, “believe in yourself!”. A third stated that she learned, “voting should be based on what one can do not on gender basis”. Another woman wrote, “I learned that women should be given same and equal opportunities to vie for any seat in the country”. Even as the campaign celebrates women’s 2017 victories, it’s clear that there’s more work to be done. While Kenya has made strides towards more gender-inclusive leadership, the 2017 election numbers still fall short of what the 2010 Constitution calls for. The two-thirds gender rule is a 2010 mandate for increased political involvement of women. Two organizations, Center for Rights Education and Awareness (CREW) and Community Advocacy and Awareness Trust (Crawn Trust), are pushing for a court declaration that Parliament violated to comply with the two-thirds gender rule. Women, 2022 is on the horizon. Start sharpening. Previous Post Could the next generation turn the tide in Haryana?